When Americans think about traveling to Europe, they have an image in their heads of fairy-tale like towns that will transport them back to a time long since gone. They imagine towns with cobbled-stoned streets, colorful half-timbered buildings and perhaps a Knight in Shining Armour. But many don’t realize, nor can imagine the wrath of destruction that destroyed so much of Germany during the Second World War. However, there were a few towns and cities that managed to escape the fury of one of the most ruinous wars Europe had ever seen. 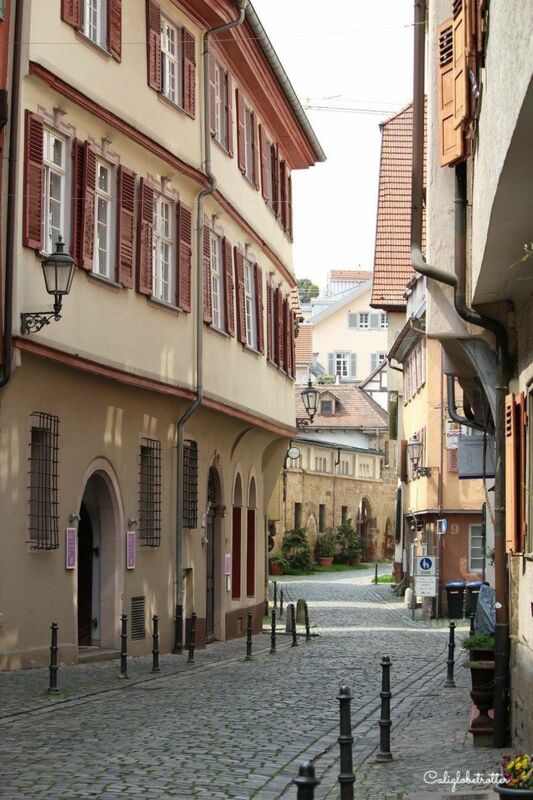 The small town of Esslingen am Neckar is just one of those perfect examples of medieval towns that escaped unscathed. 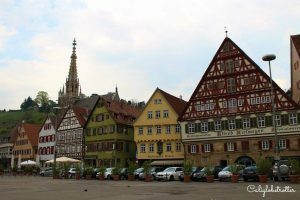 Just a short train ride away, or even a quick 15 minute drive from Stuttgart, Esslingen am Neckar is a town few have ever heard of. But have no fear, it’s worth every ounce of effort to make it to this adorable little town. 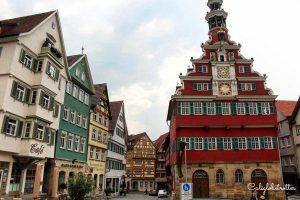 Nestled in a valley surrounded by endless rows of vineyards along the Neckar river, Esslingen is the epitome of historic medieval German towns. Don’t even get me started on how awesome Esslingen’s Medieval Christmas Market is too! In case you’re interested, PIN IT FOR LATER!! Perhaps one of the best aspects, and one of my absolute favorite things about Germany, is the preservation of colorful historic half-timbered houses. 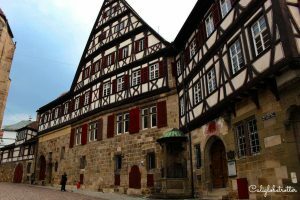 Esslingen is home to over 200 historic half-timbered houses that date back to the Middle Ages which are a fine example of how wealthy the town was during this time. Over the course of the history of the town, it developed from a small pilgrimage site, to a market town to finally a north-south trading route which allowed wealth and power to flow through the town. 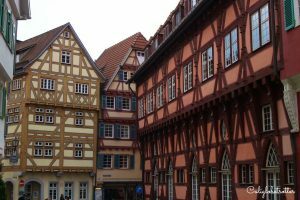 Today, the half-timbered houses in Esslingen are the oldest inhabited buildings in Germany. Within minutes of walking into the town, every angle, every corner, every building is absolutely picturesque. Like many historic towns in Germany, the small allies wind their way, following the cobbled-stoned paths. Eventually we came upon the historic and quite adorable little red city hall which was first built in 1423. The façade of the city hall is classic Renaissance architecture which is one of my favorite styles making it one of the most stunning city halls in Germany! 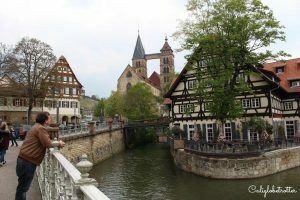 After continuing to meander through the town, we came upon an area of town filled to the brim with bridges and canals, as Esslingen sits on the Neckar river. As water played such an important role in the survival of many German towns, it’s no wonder why they built up and around the rivers. 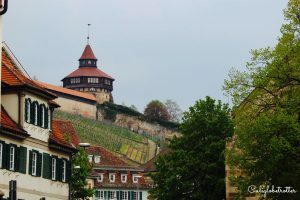 With rolling hills of vineyard surround the town, it was no surprise that one thing that made Esslingen even more unique was the fact that the town produces one of the oldest sparkling wines/Champagne-like Sekt. 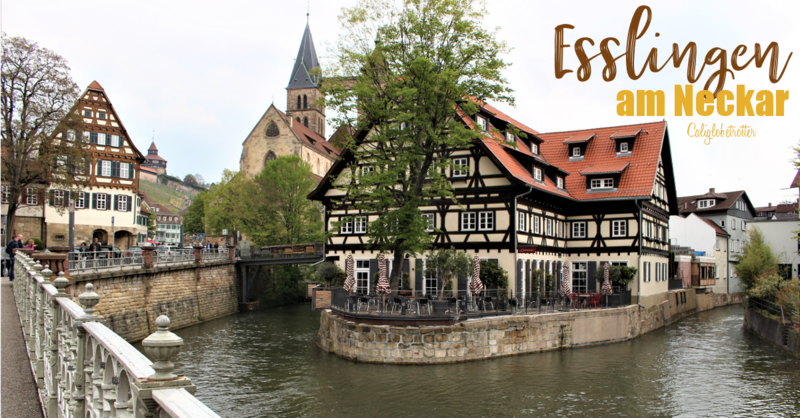 The term ‘sekt’ in Germany refers to any form of sparking wine and the term was even coined right here in Esslingen! The town was once home to monks who were known for producing wine. Today, Kessler Wines produces the sparking wine in the same building as back in the early 19th century. So clearly, sippin’ on some sekt is one of the best things to do Esslingen am Neckar. Just behind this Sekt-manufactory was a beautiful beer garden we just had to sit down in and have some lunch before hitting the road. In Baden-Württemberg, some traditional meals to eat are Jägerschnitzel (schnitzel with a mushroom cream sauce) with Spätzle or Lentils with Spätzle and wiener sausages. However, being in Baden-Württemberg again, I had to order Käsespätzle which is just cheesy egg noodles. As Spring was already in full bloom, it seemed like the perfect time to stop and get an ice cream from one of the most bustling little areas of town. 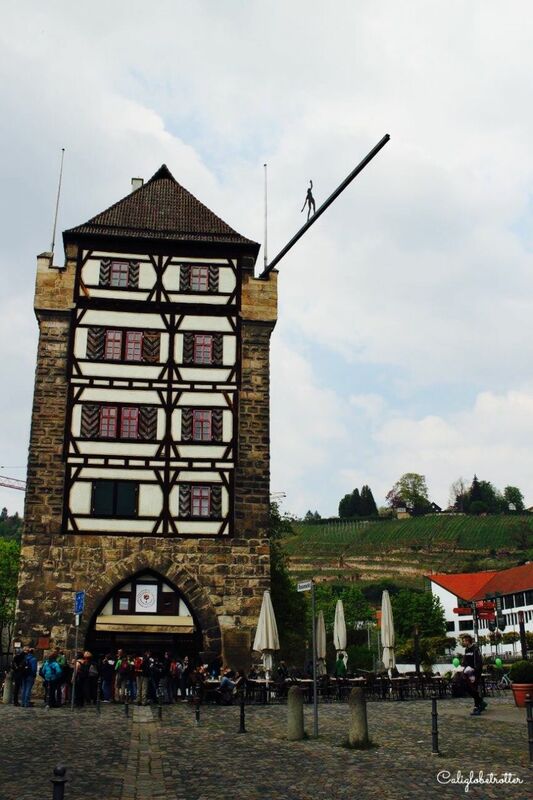 Located in the Schelztor which dates back to 1286 and is named after a family which had a small farm not far from this tower, you can enjoy an ice cream. After heading back to the car, I was sad we didn’t have more time to visit this beautiful town. I wish we had had time to take a walk up to the “Dicker Turm” (Fat Tower) on the hill which overlooked the town and had time to sample some of that famous German sekt! I guess that just means I’ll need to make another trip! 13 bloggers like this on caliglobetrotter.wordpress.com! Aaaah, it’s beautiful! I do love half-timbered buildings! First, I found your blog last week on the link up and I LOVE it. So many fantastic posts. I can’t get enough. I’m so glad to hear that you enjoy my blog! 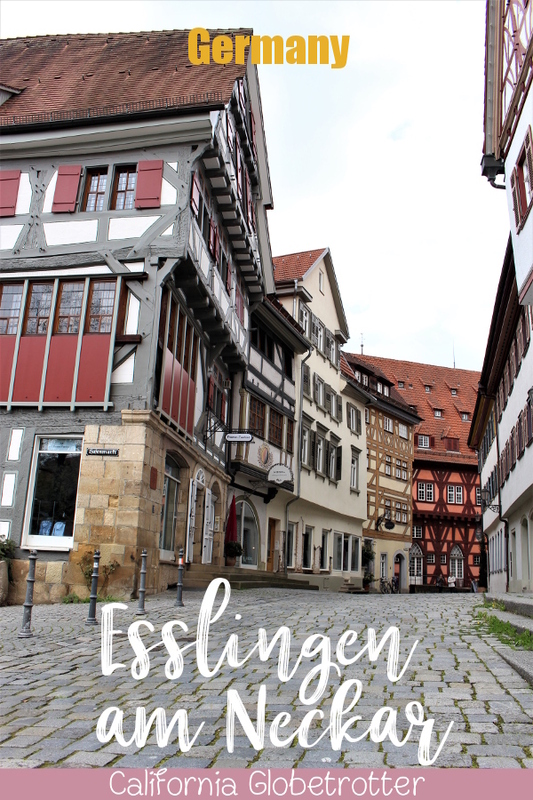 I’d love to check out the medieval Christmas market in Esslingen! You’re so lucky to have visited! Do you also love in Germany? Yes I do. My husband and I live in Stuttgart. Oh fun! Military or expat? Military. I was so happy when he got stationed here. We love it. That’s great! I’ve met so many military personnel who hate it here and I just can’t understand why. I know!!! It is such a wonderful opportunity. I don’t want to leave lol. How pretty! We are heading that way later in the year and I was looking for a stop over destination. I do love a sparkling wine and gorgeous architecture. Thanks for sharing! How stunning. I think that despite the ravages of war, there are still many fairytale places around that sate any traveller, particularly me. We have already been there! 🙂 blogged about it too already! It is amazing! This town is so cute! I am glad it wasn’t destructed during the war. The town hall is very unique. One of the reasons I would like to live in Europe would be the ability to move around and discover towns like this. You should definitely do it for a few years at least! It certainly makes it easy to see a lot! I’ve just finished reading All the Light We Cannot See, and one of the striking images was a man watching his quaint French hometown be totally obliterated by bombs. This town you showed us was so lucky to escape the horror and remain undisturbed. I love all the images you showed us and would like to walk through those streets myself. The architecture and the color of the town hall is fantastic. 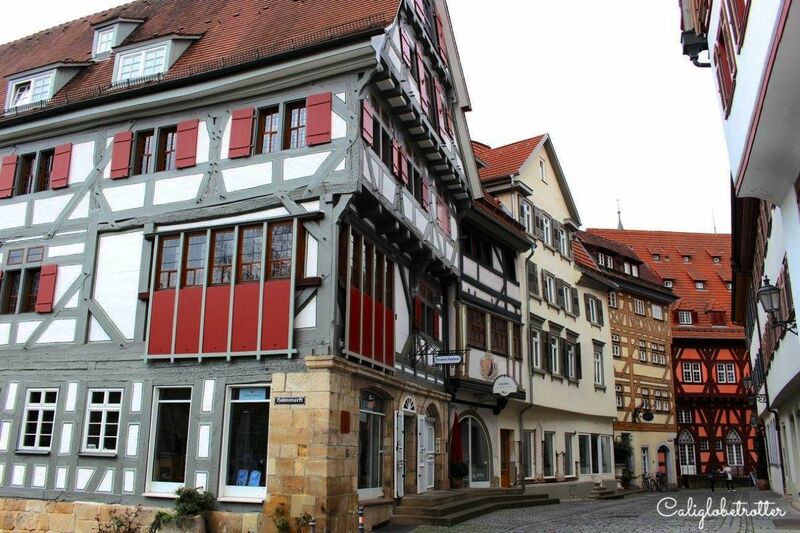 I love the little half-timbered cities of Germany, and one where there is good wine is just a bonus. Great article and photos. Thanks for linking up with #wkendtravelinspiration! See you next week! A friend of mine lived here for a year and so I spent a night visiting her. It really is an undiscovered gem. It’s charming and historic but also a real town. 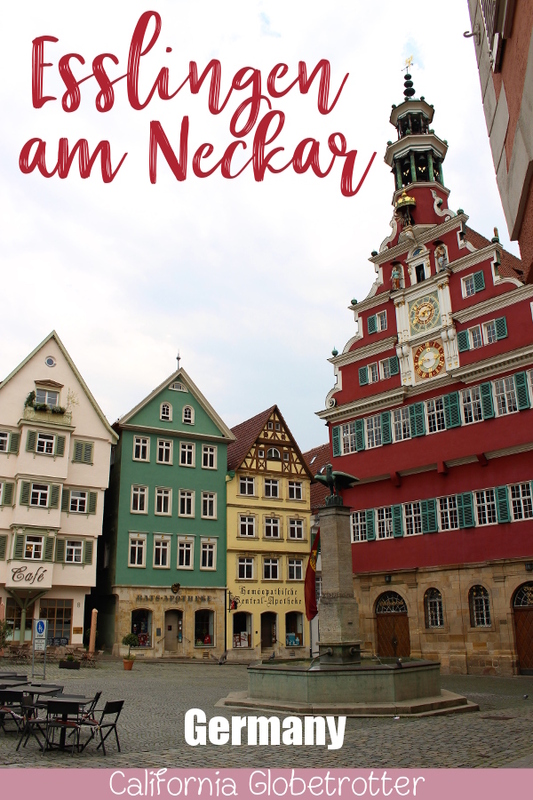 Because it isn’t on the tourist radar the way Mittenwald or Rothenberg you walk around the town amid local German people going about their business, not tourists popping photos everywhere. So it has a more relaxed feel. nice find! #wkendtravelinspiration.